No Financial relationship exists between HDiQ Dental and any product mentioned in this course. Kushida CA, Morgenthaler TI, Littner MR, Alessi CA, Bailey D, Coleman J Jr, Friedman L, Hirshkowitz M, Kapen S, Kramer M, Lee-Chiong T, Owens J, Pancer JP. American Academy of Sleep Medicine. Practice Parameters for the Treatment of Snoring and Obstructive Sleep Apnea with Oral Appliances: An Update for 2005. Sleep. 2006 Feb 1;29(2):240-3. Dr. Kent Smith reviews sleep apnea and the key terms that are associated with sleep apnea. Dr. Smith reviews what to look for in your patients that may have sleep apnea. Dr. Smith continues to discuss screening patients for sleep apnea using the Mallampati score. 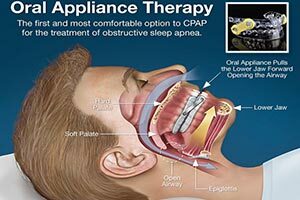 Dr. Smith reviews the three different options for treating sleep apnea. Dr. Smith demonstrates how to verbalize the need for treatment to a patient. Dr. Kent Smith demonstrates the delivery of the appliance and then walks thru the procedure for each of the follow-up appointments.